Kendra focuses on marrying data with organization and brand strategy. She spent her mid-teens completing her undergraduate studies in Political Science and Theatre. As a 17-year-old with a Bachelor’s degree, she spent a year studying studio art and playing rugby (mostly because her exgirlfriend told her that she couldn’t). At 18 she started a Political Science Ph.D. program, only to decide two years later that she wanted to leave academia and change the way people think about data and information. Oddly enough, she uses everything she studied on a daily basis. Kendra has now spent the better part of a decade working for marketing and consulting firms, as well as on a few product/startup projects. 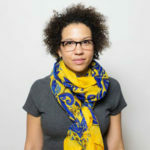 She occasionally lectures on turning raw data into usable (and useful) insights, finding metrics and key indicators that speak clearly to bespoke strategic foci, and data-driven storytelling.Kendra is passionate about experience design, information design, and using data to inspire empathy.